Two months later and the Elsa requests just keep coming in. 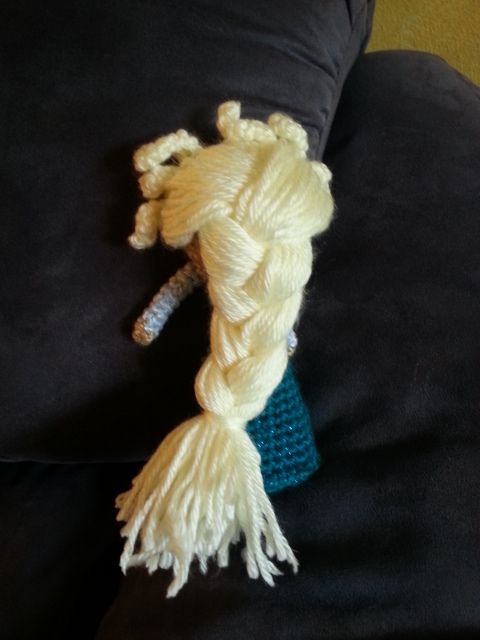 Back in May I made Elsa for my son after repeated requests. He took her to school (and everywhere else he went) and when he came home it was, “Mommy I need 6 more Elsas and Marshmallow or a troll.” Uh… what? He needed one for all of his Frozen fan friends. Some also wanted Anna. I reminded him I had a day job. He decided we should open a Frozen stand, you know, like a lemonade stand but with Frozen amis. I again reminded him I had a day job. He insisted we would make a lot more money with a Frozen stand than I would at work. He was probably right, but I did not quit my job. I mentioned all of this to a coworker. Her and her sister put in their requests which totaled 3 more Elsas and Annas for their daughters. I was now up to to 13 Frozen ami requests, which didn’t even include my son’s request for an Anna of his own. When I went to read to my son’s class one day, one of the girls asked me when I was going to make their Elsas. I really needed to get started. In my head I was going to make all these Elsas before the end of school. 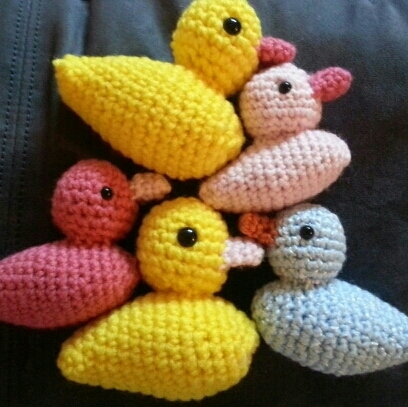 As is more my style, I waited until a few days before the last day of school and crocheted feverishly staying up late but finishing only 4 of the requested 6. 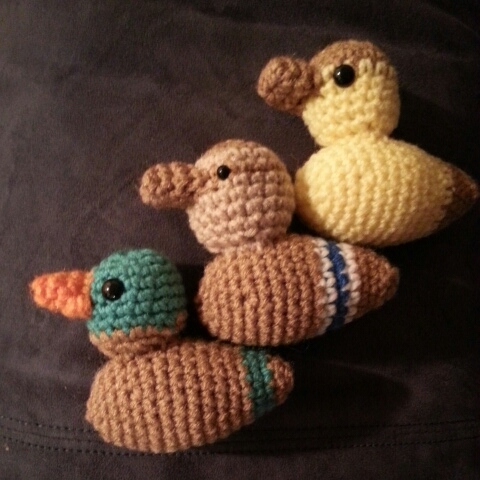 I made two each of two different patterns. Two had mouths and two did not. The two without mouths quickly acquired mouths when the new owners grabbed highlighters and drew them on (to my son’s dismay). Lesson learned, make sure to include a mouth. My son came home saying everyone wished their mom could make Frozen people too. I had Frozen superpowers! 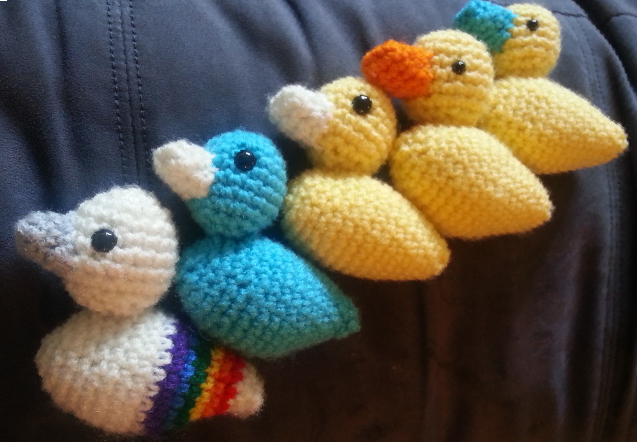 So here it was 3 weeks after school got out and while I had made a lot of ducks, I had made no more Elsas and my son’s Frozen birthday party was just days away. The Elsaless kids were sure to be there. 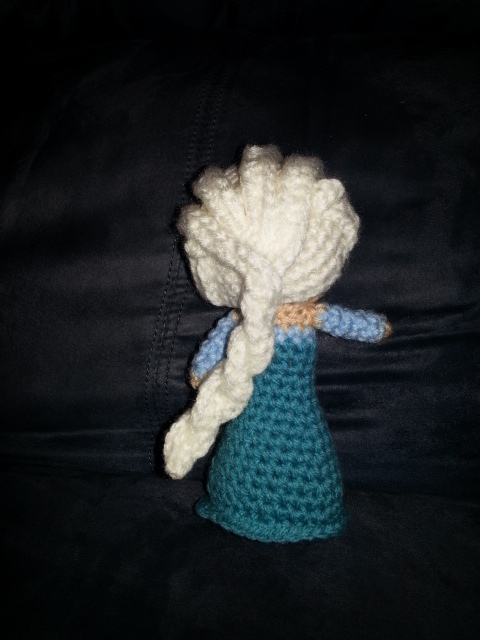 This time in my head, I was going to be able to make 3 Elsas, 3 Annas, a bunch of trolls and some Olafs. As I sewed together a troll an hour before the party, my Frozen ami count was at all of 5. 2 Elsas, 2 Annas, and 1 troll. Being that I was not quite sure how many people were going I was resigned to knowing this was all that was getting done before the party. As it turned out, less kids than I thought ended up at the party, which was good. Who wanted Anna? Only 2 hands went up. Great! I had 2 Annas. Who wanted Elsas? 3 hands went up, so we did a raffle which of course ended up with one very upset boy. Luckily for my guilt, the boy goes to camp with my son, so we struck a deal that he’d get one in a few days. The troll happened to be requested by someone who came to the party so he got his troll. Of course he said he really wanted Marshmallow. I almost tool the troll back. After a total of 7 Elsas, 3 Annas, and 1 troll being completed, I still have outstanding requests for 4 Elsas and 3 Annas as well as 2 half made Olafs lying around. I almost feel like if I finish them, I’ll just end up with more requests and it will never end. My father, aunt, and husband keep talking about Olaf. Are they dropping hints? So after a bit of Frozen ami experience with a few different patterns, I will say I have ended up with some favorites. 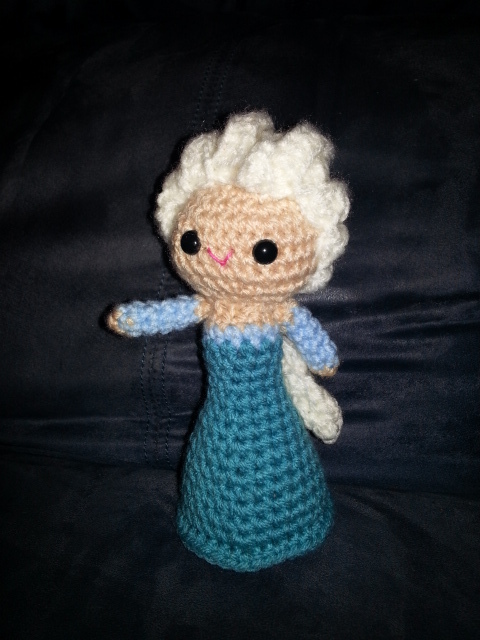 The first Elsa I made for my son was by Ohana Craft. 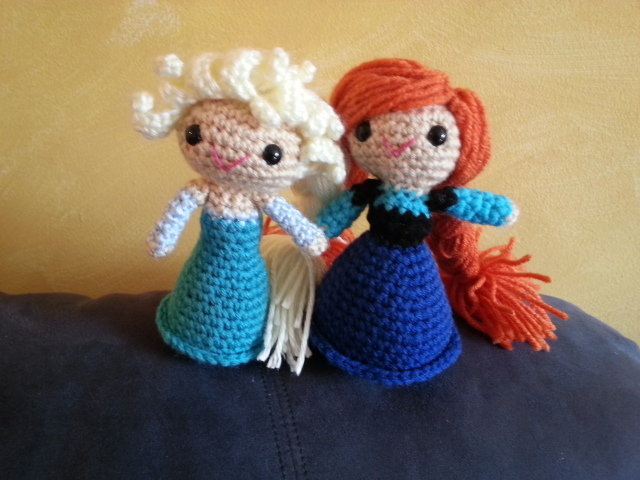 She has patterns for several of the Frozen characters including young and older versions. Her patterns, like several of the Frozen patterns I found, are not cheap. 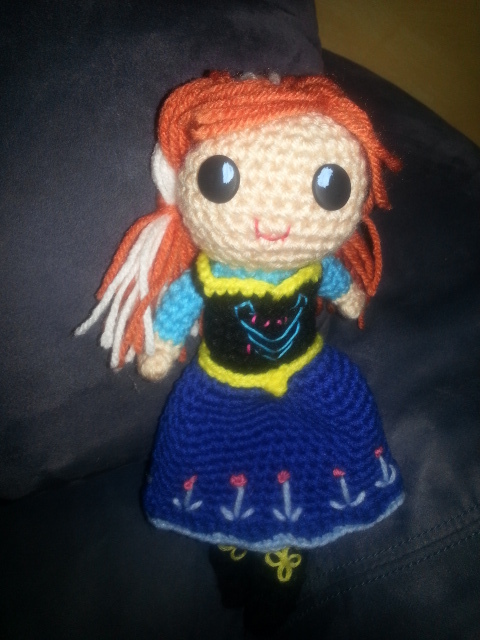 I made her Anna for my son also, and I love how she came out. 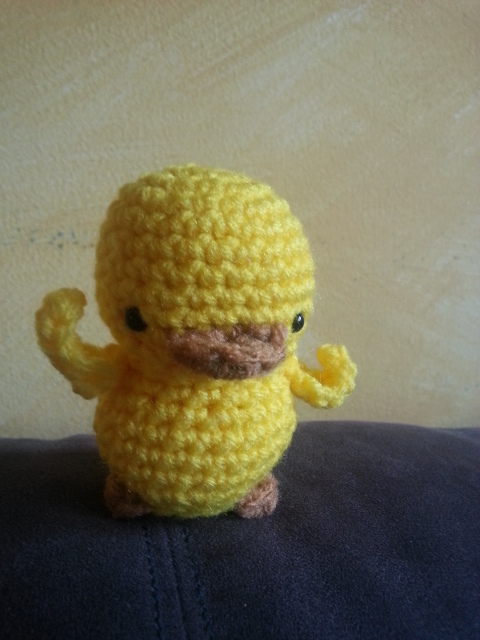 However, I did get into a fight with a glue gun while making her and I did not win. I think the burns are still healing. 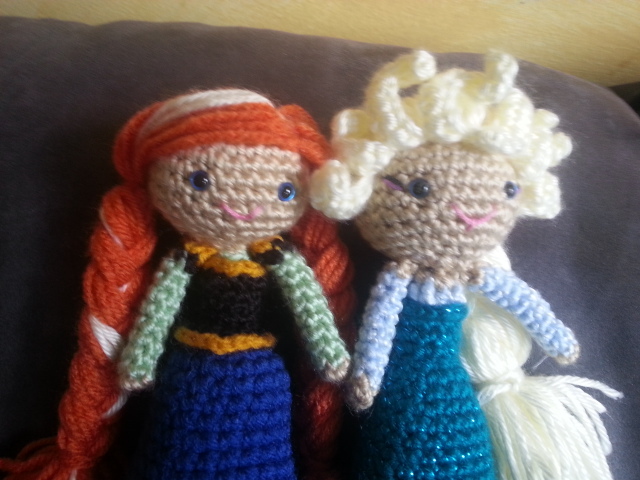 Because the Ohana Craft Elsa and Anna were both larger, they took longer, so I chose smaller patterns for mass production. Jana Whitley’s Elsa and Anna patterns were my favorites. They work up very quickly and are super cute. They’re also only $3.00 each. 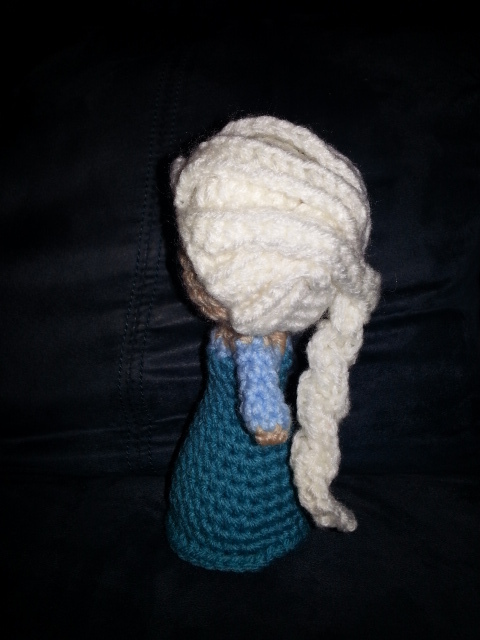 While the Jana Whitley Elsa hair is very clever and quick construction, the hair from Sahrit’s Elsa pattern is absolutely amazing. 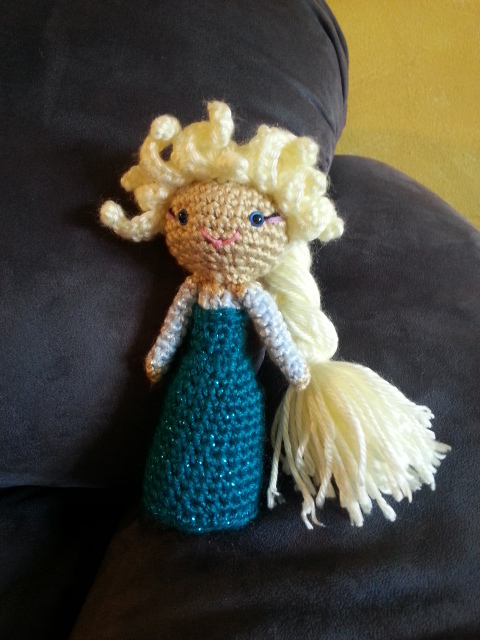 My favorite Elsa is made following the Jana Whitley pattern but with the Sahrit Elsa hair. My favorite Anna uses the Jana Whitley pattern but I hooked the hair onto the wig cap instead of using a sewing machine. While I’ll be using the Jana Whitley patterns for my 7 remaining requests, I did come across some INCREDIBLE Elsa and Anna patterns last week on Etsy. They were expensive but also super amazing. I bought one of them and it does look like a project that will take quite a while, so it will not make it into my mass production pattern collection. Not to be forgotten, I do love how my troll came out. I only found one pattern for the trolls, but you only need one. 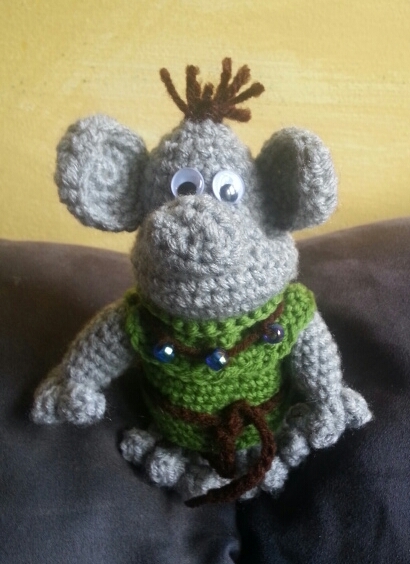 The designer of the troll pattern just released Marshmallow the day before my son’s party. If I get a breather between Elsa’s I might give him a shot. Interestingly, I did find that several of the Frozen patterns contained errors. Not a huge deal, but it did make them take longer to make, especially since I didn’t write notes on the patterns the first time around. So, I’m curious to know if you’ve made any Elsas and if so have you been swamped with requests for more and more and more? 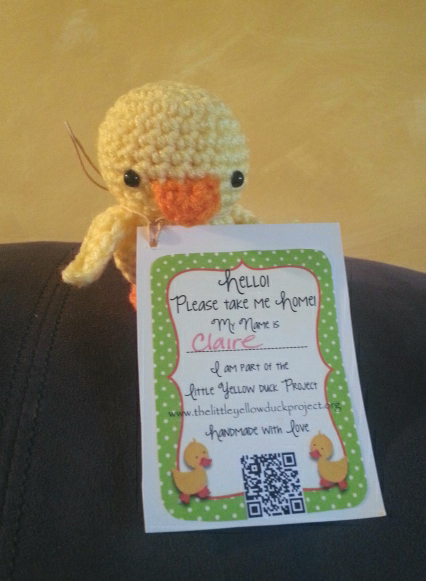 If you crochet, haven’t made any, and know any 3-9 year olds, what are you waiting for? You too can be a Frozen superhero. All you need is some yarn, a hook, and maybe a pattern or two.